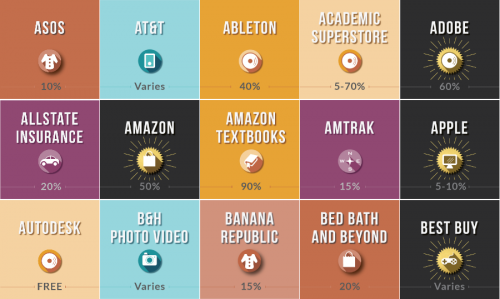 It's no secret that the best deals in student discounts are all in software. Companies like Adobe and Microsoft offer discounts up to 50% off to both students and teachers on popular programs like Microsoft Office and Photoshop. They do this because they know these groups have a limited budget, and they are hoping to make customers for life. In addition to discounted software, you can also find a few choice free deals out there. For example, the GitHub Development Pack offers an entire suite of programming software free to students. Typically, you'll need a student ID or school email address to qualify for cheap educational software. For one-stop shopping, merchants such as Academic Superstore offer nearly all popular software titles, with the discounts are good for teachers, students, and parents with proper validation.